One who wishes to eat from the meat of a slaughtered animal before its soul departs may cut an olive-bulk of meat from the area of its slaughter, the neck, and salt it very well and rinse it very well [in water to remove the salt and blood,] and then wait until the animal’s soul departs, and then eat it. Both a gentile and a Jew are permitted to eat it [because the prohibition against eating a limb from a living animal is not applicable in such a case]. This teaching supports the opinion of Rav Idi bar Avin, as Rav Idi bar Avin said that Rav Yitzḥak bar Ashyan said: One who wants to be healthy should cut an olive-bulk of meat from the area of the slaughter, and salt it very well and rinse it very well, and then wait until the animal’s soul departs, and then both a gentile and a Jew are permitted to eat it. Today we learn about a very strange (and disturbing) talmudic folk tradition. If you want to stay healthy, cut some meat from the throat of an animal that had been slaughtered by the usual method of shechita - but do so before the animal has died. Since there is a very strong prohibition against eating meat taken from a living animal, the Talmud goes out of its way to note that it does not apply in this case. The folk remedy apparently demanded that the meat be taken before the animal is dead - and so waiting would defeat the whole purpose. Now this sounds pretty cruel. But since the Talmud brought it to our attention (and permitted or even encouraged it) we must take a detailed look into the question of how our modern sensibilities and our modern science might approach the complicated question of the relationship between animal suffering and shechita. Laws across Europe and European Union regulations require that animals be rendered insensible to pain before slaughter, to make the process more humane. For larger animals, stunning before slaughter usually means using a “captive bolt” device that fires a metal rod into the brain; for poultry it usually means an electric shock. Animals can also be knocked out with gas. The idea for the ban was first proposed by Ben Weyts, a right-wing Flemish nationalist and the minister in the Flanders government who is responsible for animal welfare. Mr. Weyts was heavily criticized in 2014 for attending the 90th birthday of Bob Maes, who had collaborated with the Nazi occupation of Belgium in World War II and later became a far-right politician. Rabbi Schmahl [a senior rabbi in Antwerp] cited another Belgian law that was recently enacted, to regulate home schooling — a common practice in his community — as an example of a pattern of laws in Europe making it increasingly difficult for observant Jews to live according to their traditions. “It definitely brings to mind similar situations before the Second World War, when these laws were introduced in Germany,” he said. Whether that’s so should be a matter of continuing study by the meat and poultry industries, animal scientists, veterinarians and governments. There is no question that the animals we raise for food should be exposed to the least suffering possible, just as there is no question that killing a healthy creature has enormous potential for cruelty. — Nicolas Malebranche. Oevres completes. ed G. Rodis Lewis. Paris, J/ Vrin 1970. II. 394. In the 1970s the Royal Society made a film for schools that reproduced Harvey’s vivisections. I have met two people who were shown it at school; both told me that they could not bear to watch it all, and that some of their co-students fainted. As we have seen previously, animals were regularly put on trial in talmudic times through to the middle ages. It’s a paradox that on the one hand we once thought of animals of being culpable for crimes, while on the other we believed them incapable of thought or experiencing pain. We know a lot more today. Animals feel pain. About this there is fortunately no more debate. But there is a question about how an animal that is slaughtered feels pain, and how that pain may be reduced. — Rabbi Jonathan Sacks addressing a debate on shechita in Britain's House of Lords, January 16, 2014. But as we make our way through the tractate Chullin, there is no mention of the pain of the procedure. And with very few exceptions that we will come to, it was not until modern times that anyone made the claim that we slaughter animals using shechita because it is as close to being painless as possible. We do it because that’s been a part of Jewish tradition. In 1994, Temple Grandin, the great champion of humane slaughter observed that cattle did not yank away their necks during shechita. 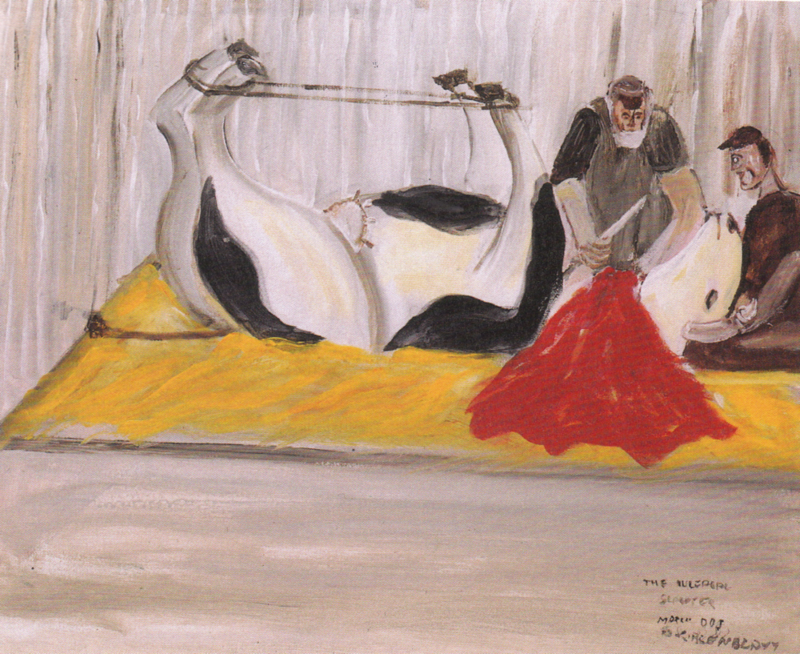 “All of them stood still during the cut and did not appear to feel it” she wrote, though she also noted that “whether or not ritual slaughter conforms to the requirements of euthanasia is a controversial question.” Since then others have looked into the question of brain activity as a marker of pain during shechita. In 2009 a group of veterinarians in New Zealand hooked up fourteen Angus steers to an EEG, which measures the electrical activity in the brain. They were lightly anesthetized (the cows, not the veterinarians) and then slaughtered with an incision across the neck, “severing all tissues ventral to the vertebral column including the major blood vessels supplying and draining the head.” During the 30 seconds following this incision, the EEG showed significant changes leaving the scientists to conclude that “…there is a period following slaughter where ventral­ neck incision represents a noxious stimulus.” In a slightly different study on calves, the group concluded that the EEG responses were primarily due to noxious stimulation and not mainly as a result of loss of blood flow through the brain. It is possible that cutting a cow’s neck with a short, blunt, non-smooth knife is indeed painful, while a shechita cut may be significantly less so or even totally devoid of pain. Does the animal feel no pain? Might it even be a pleasurable feeling, e.g., are endorphins released? I don’t know. But many people who have gotten a paper cut or who have been cut by a scalpel can attest to the fact that while the cut is taking place it is essentially not sensed and it is only later that the pain kicks in. And in the case of shechita, the animal will be senseless by that point. It would be hard to believe that the sensation of having your neck sliced open would be similar to that of getting a paper cut - and harder still to think that it might even be pleasurable. But here is a suggestion: do the experiment (though not on your friends) and let us know. Captive bolt stunning followed by sticking one minute later resulted in immediate and irreversible loss of evoked responses after the stun. Spontaneous cortical activity was lost before sticking in three animals, and in an average of 10 seconds after sticking in the remaining five animals. The duration of brain function after shechita was very variable, and particularly contrasted with captive bolt stunning with respect to the effects on evoked responses. These were lost between 20 and 126 seconds (means of 77 seconds for somatosensory and 55 seconds for visual evoked responses) and spontaneous activity was lost between 19 and 113 seconds (mean 75 seconds) after slaughter. The authors did add a note of caution: “…evoked responses do not rep­resent a conscious awareness of the stimulus but are produced by neural activity at a rudimentary level which precedes con­scious awareness.” But even so, these findings must raise the concern that the animals had a degree of brain activity for far longer after shechita compared to captive bolt use. And back to Grandin again: “Penetrating captive bolt, when it is applied correctly, will induce instant insensibility and unconsciousness, because visually evoked potentials are eliminated from the brain.” So there it is again: instant versus not-so-instant. 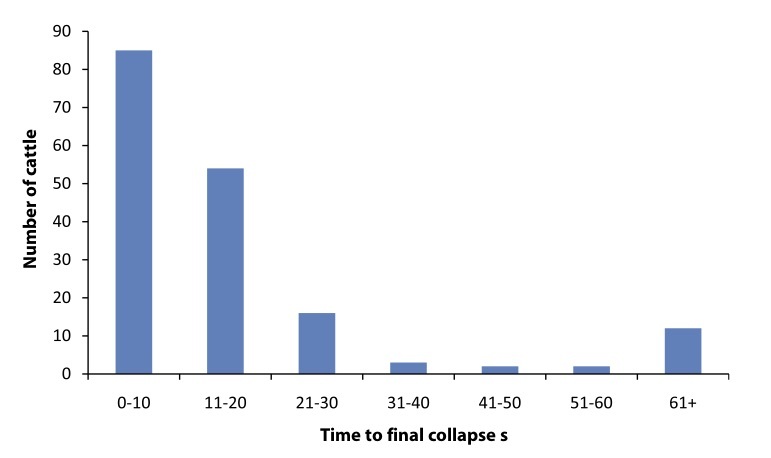 Frequency distribution of the cattle according to time to collapse following halal slaughter without stunning. From Gregory N.G.et al. Time to collapse following slaughter without stunning in cattle. Meat Science 2010: 85; 66–69. While it is often claimed by those who support shechita that it causes an immediate loss of consciousness (see above, Henry Grunwald the OBE QC), this is not to be the case. Grandin, who collected data from five kosher plants in different countries noted a huge variation: from as little as eight seconds to as long as a full two minutes. (Average times were somewhere between 15 and 35 seconds.) As we have seen, when properly applied, a captive bolt captive bolt provides an instant loss of consciousness. If the claim that “kosher animals were created with nerves ending at their shoulders, thus circumventing any feeling of pain” sounds ridiculous, that’s because it is. Does Anonymous believe that there are no cutaneous nociceptive nerve endings in cattle above the neck? If so, has he (or she) ever patted the neck of a cow or a horse? The cranial nerves in cattle, “have in general the same superficial origin as in the horse” wrote Septimus Sisson in his classic Textbook of Veterinary Anatomy (p. 717). There are some minor differences of course; the oculomotor nerve is slightly larger in the horse, and the superior buccal nerve crosses the masseter much lower in cattle than in the horse. But none of these comes anywhere near to the claim made by Anonymous. You could check this by reading Veterinary Neuroanatomy and Clinical Neurology (4th Edition). Then, if you have time, you could review Comparative Anatomy of the Horse, Ox, and Dog: The Vertebral Column and Peripheral Nerves, or its companion Comparative Anatomy of the Horse, Ox, and Dog:The Brain and Associated Vessels. You will find that it is the similarities between the species that is remarkable. Schematic illustration of the autonomous and cutaneous distribution of nerves pertaining to the head of the (A) dog, (B) horse, and (C) ox. O = ophthalmic nerve; Mx = maxillary nerve (* = also within the maxillary distribution of the horse); Mn = mandibular nerve. From Levine J, et al. Comparative Anatomy of the Horse, Ox, and Dog:The Brain and Associated Vessels. And what about the claim that there is a “physiological difference between the blood flow of non-kosher animals and kosher ones” (and that this information “could only be Divine")? Well, this too is wildly inaccurate. Of course there are some differences between species. For example, in horses, the Circle of Willis at the base of the brain is supplied by the internal carotid and basilar arteries. In cattle, the blood supply to the circle is via the internal carotid, maxillary, occipital, and vertebral arteries. And so, in cattle “the cerebrum receives a mixture of blood from all sources.” But there is no important physiologic difference in the blood flow of a horse and a cow. Do not respond to criticism of shechita with an ad hominem attack that the critic is an anti-semite. Stop worrying about the motives of those who question whether shechita is more or less humane than other methods of slaughter (like this Star-K website did). Yes, some people who do so are decidedly anti-semitic, but many who defend shechita are pro-semitic, and they are not disqualified from the debate. Discuss the science, not the motives of people. Fight any anti-Semitism rigorously, but separately. Don’t claim that shechita “has been established over centuries to be the most humane form of animal slaughter” without the scientific data to support this claim. (For another example see the Rabbinical Assembly here.) There has been very little published research on the methods of shechita. (There appears to be more research about halal). If shechita is as humane as say, the captive bolt, (as measured by EEG tracings or evoked potentials,) then a head to head (sorry) study should be performed to compare the two. This would be a very good use of the resources available to the major kashrut organizations in the US, the UK, Israel, and beyond. — Understanding freedom of religion in a religious industry: kosher slaughter (shechita) and animal welfare. Joel Silver. Victoria University of Wellington Law Review 2011; 42; 671-704. The argument that shechita cannot be questioned or banned because it impinges on our religious freedom is not a strong one. In the modern and (somewhat) enlightened societies in which most of us live, we place limits on the freedoms to practice religion. In the US and many others countries, for example, the wishes of a Jehovah’s Witness parent who refuses permission for a life-saving blood-transfusion for their child have been consistently overruled. The rights to perform female circumcision are also curtailed – even if they are claimed to be part of a religious system. If a religion practices that which is considered immoral or unethical, then these practices should be regulated or abolished. True, this may place some religious practices like shechita or circumcision in a precarious position, but that this the price that, on average, may be worth paying. Think about this. This suggestion is not found anywhere in the Talmud. The word for suffering - צער - appears only a single time in the entire tractate of Chullin. (It is in the context of a suggestion to cut the hooves of a donkey to prevent them from kicking someone. So actually there is no mention of suffering in connection with the rules of shechita.) The word for kindness - חסד - does not appear at all. And neither of these words appears anywhere in the laws of shechita found in the Shulchan Aruch - The Code of Jewish Law. But there is a far more problematic example that challenges any claim that animals must be shechted because this - and only this - can reduce suffering. It concerns the Ben Pakua, (lit, “the offspring that has broken through”) which is a viable calf found in utero after the shechita of its mother. Such an animal may be slaughtered and eaten without shechita. Let me repeat that. A viable calf found in utero may be eaten without shechita. In fact according Rabbi Shimon ben Shezuri, even if that calf grew up to be five years old, “its mother’s shechita purifies it” and it may therefore be killed and eaten without shechita. Practically speaking though, it is not allowed to eat a Ben pakua without shechita. If you thought that the reason is that because shechita is so humane, and so it is the only way a Jew may eat meat, you are wrong. The Talmud and later sources have no such concerns. The reason it must be slaughtered with shechita is to prevent confusion. The farmer might mix up (דלמא אתי' לאחלופי בשאר בהמות) the Ben pakua with a non Ben pakua animal; the latter would then killed without shechita when in fact shechita was needed. That’s the reason we require a Ben pakua to be eaten only after shechita. But to our point, there is absolutely no mention of the need for shechita out of any concern for the pain or suffering of the animal. None. But this does not imply that animal suffering was ignored. Among the earliest suggestions that shechita was practiced to minimize pain can be found in the Sefer Hachinuch (The Book of Education). It was written anonymously sometime in the thirteenth century but not published until 1523, and was attributed to R. Aharon Halevi of Barcelona. ועוד נאמר בטעם השחיטה מן הצואר ובסכין בדוק, כדי שלא נצער בעלי החיים יותר מדאי, כי התורה התירן לאדם למעלתו ליזון מהם ולכל צרכיו, לא לצערן חינם, וכבר דברו חכמים הרבה באיסור צער בעלי חיים ... אם הוא אסור דאוריתא, והעלו לפי הדומה שאסור מדאוריתא. Another reason that we must perform shechita at the neck with an approved knife is so not to be too cruel to the animals. For the Torah gave us permission to gain nourishment from them but this does not allow us to cause pain to them for no reason...And the rabbis have stated that the prohibition against animal cruelty comes from the Torah itself. By any measure, this sentiment was far, far ahead of its time; recall what Descartes was thinking and Harvey was doing in the sixteenth century. But you will find that simply declaring that the reason for shechita is that it is “the most humane method of slaughter” is not really supported in classical Jewish texts until much later (if at all). A reason given for this mitzvah [of shechita]…is because of the [prohibition against consuming] blood…and in addition because of the laws preventing cruelty to animals… and the reason that it is forbidden to use a damaged knife blade because of the issue of cruelty to animals. There are of course hundreds of other references to shechita and cruelty in the works of those who rule on Jewish law from the sixteenth century to contemporary times. (I’ve found at least 300 of them, but have not yet had the time to review them. It would be a great topic for a PhD.) But these are all ex post facto. And if that doesn’t convince you, you might want to read our three-part series on the folly of trying to reconcile Jewish Law with contemporary science. Don’t compare the best of shechita (quick and painless) with the worst of captive bolt use (incompetent and unreliable). In her Recommended Captive Bolt Stunning Techniques for Cattle Temple Grandin suggested as an industry standard that 95% or more of the animals are rendered insensible with one shot whether penetrating or not. Under US Department of Agriculture (USDA) regulations (9 CFR Ch. III, 313.15) “captive bolts shall be of such size and design that, when properly positioned and activated, immediate unconsciousness is produced.” When Gradin studied the efficacy of penetrating captive bolt stunning of cattle, she found that among steers and heifers, 0.16% had signs of returning to sensibility, and 1.2% of bulls and cows did. “Return-to-sensibility problems” she wrote, “were attributed to storage of stunner cartridges in damp locations, poor maintenance of firing pins, inexperience of the stunner operator, misfiring of the stunner because of a dirty trigger, and stunning of cattle with thick, heavy skulls.” In a study of addressing the complications during shechita and halal slaughter without stunning in cattle, the authors estimated that 10% or more cattle develop complications during the bleeding period during normal halal and shechita slaughter. If this figure is accurate, the shechita organizations must address and improve their regulations. And if it is not, these same bodies should publish the evidence that shechita has fewer complications than captive bolt use. That’s true. But so what? Slavery (or some form of it) is regulated in the Torah, and its rules and regulations are discussed in the Talmud. But we don’t own slaves, and find the thought morally repugnant. There are no Jews complaining that the thirteenth amendment to the US Constitution banning slavery was unfair, because hey, the Talmud says we can have slaves. Some things must be given up when the failure to do so is morally untenable. 7. Even if procedures like stunning or the captive bolt are shown to be more humane, we could never adopt them because of the laws of shechita. Well, not so fast. Of course there are segments of the orthodox Jewish population that would never adopt these practices, because, well, the science is wrong and suspect and anyway of course shechita is humane see above). But there are large segments of the orthodox Jewish world who agree that Judaism has nothing to fear from evolving and adapting to new situations. …the outstanding merit of the pen is that vigorous and restless animals which under existing methods might have to undergo long minutes of suffering and terror, often attended by severe injuries, are by its use cast and brought into the required position for the cut with the same rapidity and freedom from pain as the quiet ones. Even the greatest of the cruelties any of the present methods of casting would thus be brought to an end by the adoption of the mechanically working pen. From Temple Grandin and Joe Regenstein, here. When the device was rolled out in 1964, The New York Times reported that “Rabbi Israel Kiavan, executive-Vice president of the Rabbinical Council of America, a prominent Orthodox group, hailed the Society's announcement as dramatic break through preparing animals for slaughter." But although this addressed the preparation of the animal and not the shechita itself, this new position could impede the action of the shochet who now had to cut against gravity. So it was in fact a practice that might impair kosher slaughter. In an undated responsa Rabbi Moshe Feinstein ruled that shechita of a large animal was permitted (אבל כשיקשרו ראש הבהמה למעלה סובר אני שיש להתיר אף לכתחלה ) when the animal was in an upright position. Again, this innovation addressed the pre-shechita set up, but it shows how traditional shechita methods were greatly improved upon, with a little help from some clever engineers, and then approved by rabbinic authorities. Changes around the edges of the methods of shechita have certainly been accepted by the Orthodox community, but they need to do more. Produce the evidence that traditional shechita is not less humane than other forms of slaughter, or be prepared for further demands from those not only concerned with the right to religious freedom, but with animal welfare too. From Legal Restrictions on Religious Slaughter in Europe, Law Library of Congress March 2018. This uncircumcised man, what are the circumstances? If we say that he is an uncircumcised man whose brothers died due to circumcision and the concern is that he might suffer a similar fate, clearly he may slaughter, as he is a full-fledged Jew and not a transgressor at all. Rather, it is obvious that he is a transgressor with regard to remaining uncircumcised, as he refuses to be circumcised, and the tanna holds that he may nevertheless slaughter an animal since a transgressor concerning one matter is not a transgressor concerning the entire Torah. The Talmud here is referring to the sad case in which a mother loses her sons because they bleed to death following circumcision. In this encore presentation, let’s revisit the topic, which we first met way back in Yevamot 64a. It was taught: If she circumcised her first son and he died, and her second son and he too died, she should not circumcise her third son, so taught Rebbi. Rabbi Shimon ben Gamliel stated that she should indeed circumcise her third child, but [if he died] she must not circumcise her fourth...Rabbi Yochanan said that there was once a case in Zippori in which four sisters had sons: The first sister circumcised her son and he died, the second sister circumcised her son and he died, the third sister circumcised her son and he died, and the forth sister came to Rabbi Shimon ben Gamliel and he told her "you must not circumcise your son" (Yevamot 64a). The Talmud here is describing a disease that is affected through the maternal line (hence the four sisters - all of whom seem to pass this disease on to their male children). The disease is X-linked Hemophilia A; the term X-linked indicates that the faulty gene is carried on the X chromosome, which is men is always inherited from the mother. Hemophilia A is an X-linked recessive genetic disease, first described by the American physician John Conrad Otto, who in 1803 described a bleeding disorder that ran in families and mostly affected the men. John Hay from Massachusetts published an account of a "remarkable hemorrhagic disposition" in the New England Journal of Medicine in 1813. Hay, John. Account of a Remarkable Haemorrhagic Disposition, Existing in Many Individuals of the Same Family. New England Journal of Medicine 1813:2;3;221-225. The rabbis argued over a technical point - that is, how many cases of bleeding are needed to establish a pattern. According to Rebbi (that is Rebbi Yehuda Ha-Nasi, c. 135-217 CE.) two cases were sufficient, while Rabbi Shimon ben Gamliel insisted on three cases before ruling that there was a life threatening pattern. Indeed the disease in boys must have been very perplexing, because (as you can see in the diagram above) not every boy would be affected. In fact, if the mother is a carrier and the father is not, there is only a 50% chance of a boy having hemophilia. It is this fact that perhaps explains the dispute between Rebbi and Rabbi Shimon ben Gamliel regarding how many children need to exhibit the disease before we can assume that any future male child will also have it. If every boy born in the family would have been a hemophiliac, Rabbi Shimon's ruling would have seemed unnecessarily cruel. But since by chance, half of the boys born might not have hemophilia, the need to demonstrate the prevalence of the disease (in a society in which its genetic foundations were not known) seems eminently sensible. In Hemophilia A there are various genetic mutations that result in low levels of clotting factors. These levels may be only mildly decreased, or so low that severe life threatening hemophilia results. It is treated with transfusions of clotting factors which restore the levels to normal. Although these transfusions must be given several times a week in those with severe disease, there is hope that recombinant clotting factors can lengthen the time between the needed transfusions. The law discussed in Yevamot that forbids circumcision where there is a family history of hemophilia was certainly practiced. Later in Yevamot, the Mishnah records the case of a priest who was not circumcised - because of the deaths of his brothers when they underwent the procedure. Tomorrow we read that a man who was not circumcised because he had hemophilia may serve as a shochet. The Talmud records not only the earliest known description of hemophilia, but the emphasis on the preservation of life as a normative Jewish practice.